This week, The Husband and I took a short road trip to Chicago in order to return a pair of ill sized Fluevogs. I usually don't spend very much time constructing accessories for myself, but since this was a special occasion, I decided that I needed a new bracelet and hair clip. So I made one of each. I used vintage rickrac from my Granny's stash, vintage buttons, some trims leftover from another project, and some vintage quilting squares(for the ruffle). I love, love, love the way this turned out. Plus, it is amazing to travel with, since it is so soft, squishable and packable. I love the combination of creepy, plastic vintage baby with pretty, frilly fabrics in this clip. I'm scouring etsy and ebay for more of these little weirdos so I can make more of these creepy cute hairclips to share with all of you. Please excuse the crappy cell phone pic, but after a day out and about on Milwaukee Avenue, my camera was dead. 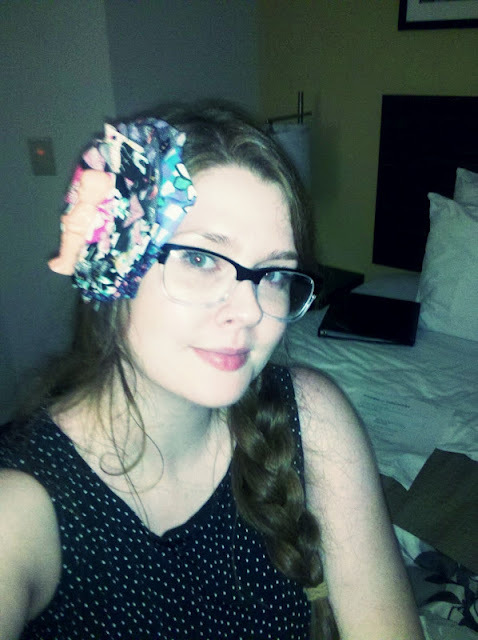 So, this is me, back at the hotel room, still wearing my big ole clip. I wanted to show you girls that despite the size, these clips are pretty lightweight. You can wear one all day and forget you even have it on. Until somebody gives you a funny look. Then you might be prompted to remember. Unless of course, like me, you are used to getting funny looks. Then it's just par for the course. Heh heh.